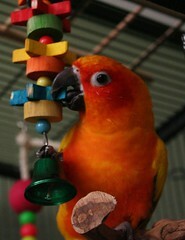 Conures are very active birds that need lots of room to play and a variety of toys to keep themselves occupied. A conure whose cage is too small could develop behavioral issues, such as screaming or plucking. 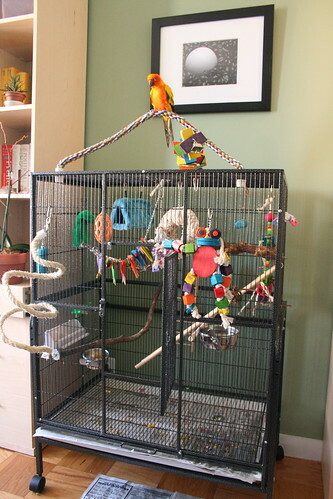 Your parrot's cage should include 4-5 different perches, and at least 4 or 5 different types of toys that get rotated out regularly. Food and water should always be available and fresh -- make sure not to place them in such a way that your bird's droppings fall into the bowls. 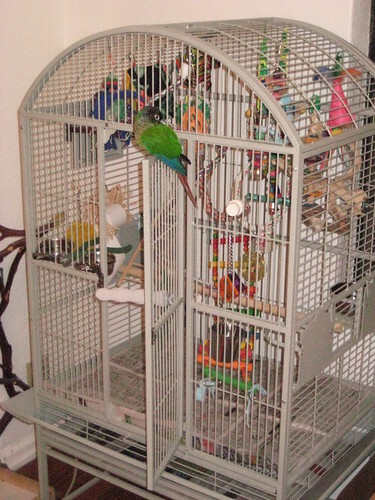 This page has examples of bird cage setups for small to medium-sized conures such as sun conures, green cheek conures, peach fronted conures and similar sized parrots. 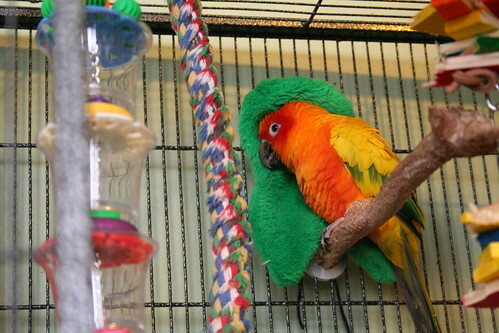 Read on for ideas for making your conure comfortable in his cage and providing a safe and fun living environment for any conure-sized parrot. Sonny and Louie are a bonded pair of conures (a sun conure and a jenday conure) who share a double flight cage with the divider removed. They are currently in a foster home awaiting adoption. Their double cage is situated half in front of the wall, half in front of the window. Their foster "mom" reports they enjoy fulfilling "their duty of being good 'watch birds' and letting me know when people are walking their dogs, etc." but they enjoy the safety of being able to retreat to the part covered by a wall if feeling threatened. Food dishes are located throughout the cage so the two don't have to compete over food. Next to the cage is a full-spectrum light. Bird supplies are stored underneath. 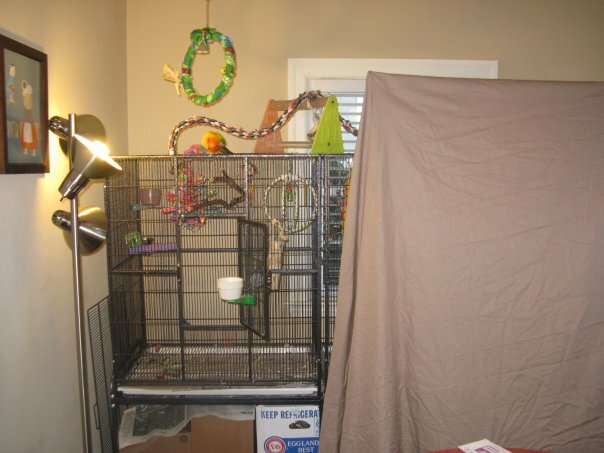 A portable perch and a rope perch have been added to the top to transform this double flight cage into a makeshift "playtop" cage. Sonny's and Louie's double cage has lots of shredder toys and natural wood branches as perches, as well as a rope "orbit" toy. They both sleep in the same fleece happy hut (in the foreground below). The foster mum also explains that "because they are in the dining room, and this place is small, when company comes over I create a makeshift privacy screen so they can choose whether or not they want to see or be seen. It covers about half their cage." Allowing shy birds the option to choose whether to hide or whether to watch the action is a great idea! The makeshift screen is a garment hanger (which can be purchased at Target or Walmart) with a sheet draped over it. Valo is a normal green cheek conure (GCC), weighing in at 72 grams. He lives in a platinum colored A&E dome top cage measuring 32" x 23" x 67". Bar spacing of 5/8" is perfect for any small to medium-sized conure, like a green cheek. Nino the Peach Front Conure (PFC) has the same dometop cage as Valo. In fact, they share the same home. They do not, however, share a cage. It's important to understand that it's not a good idea to put two birds in the same cage unless they really get along well and show signs that they want to share a cage. In this case, Nino and Valo tolerate each other but would definitely not make good roommates in a single cage. Here's Nino in his A&E Dometop cage, outfitted with several rope perches; plenty of shredder and chewing toys. PFCs are also considered small conures, so this 32" x 23" x 67" dometop cage offers plenty of room for his favorite enrichment items. 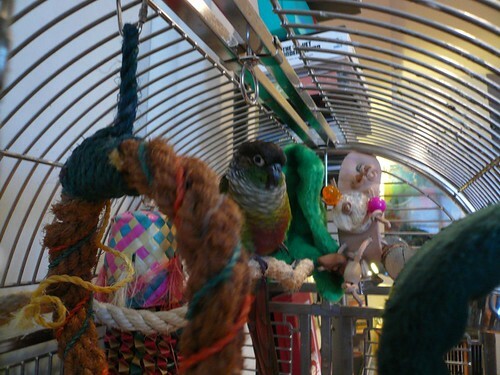 The conures' owner explains: "Though Valo and Nino are both conures, their tastes are about as different as they can be, not only regarding their food but also their toys. However, when comparing the general layout of the cages, one can see that they are set up very similar, and adjusted for individual birdie taste." The food and water dishes are located towards the front of the cage about half way between top and bottom -- away from the wall, to minimize food splatter on the walls. A sandy perch is between the dishes to help with the toe nails -- this location ensures that the conures spend some time on these "pedicure perches" since they will use them to get to their food and water. Special care is taken not to place any perches above the food dishes to minimize bird droppings ending up in either water or food. 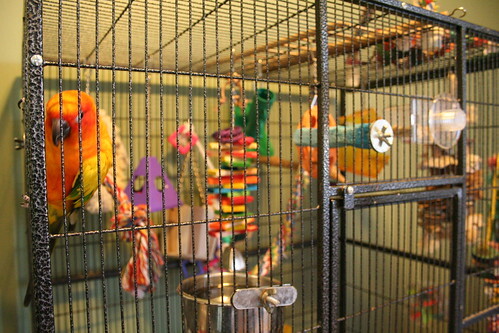 Both conures' cages are equipped with a variety of different perches of various diameter: a rope perch from the front to the back, boings (which both these conures love), and a variety of wood perches (between 2-3 smaller sized). Furthermore, a cement perch is placed inside the cage door, to facilitate getting the birds in and out of their cages. For toys, these two small conures each have buckets with a variety of foot toys (and treats), rubber football foraging toys, and shredding toys -- toys and cage layout are changed up every two weeks. The green cheek loves playing with acrylic toys, while the peach fronted conure prefers wooden toys. Just like people, birds often have very particular tastes in their entertainment (even birds of similar size or of the same species); that's why it's a good idea to provide a lot of options and variety, and to observe and experiment to see what particular birds prefer. Flight cages are very popular choices for small conures because they are an excellent value for the price. Stewie the sun conure has a flight cage measuring 32" wide x 22" deep x 24" tall (not including the base). This sun conure prefers to hang out at the top part of his cage, only coming down to the bottom when he's fetching food that he's dropped. That's why the majority of the toys and perches are near the top, although his owner sometimes places food or foraging items near the bottom to encourage full use of the cage. Stewie has plenty of room to jump or play near the bottom if he feels like stretching his wings. The outside is also decorated with perches (a rope perch at the top, to make a DIY playtop, and a sisal boing) as well as toys. 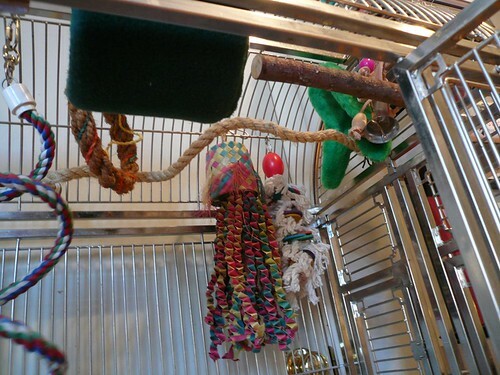 On the inside, toys, perches, and food and water bowls are rotated regularly. While food and water bowls may sometimes be placed high in the cage or low, the owner always makes sure there are no perches above them. In fact, care is taken not to place bowls in a part of the cage where the bird might end up pooping (regardless of whether there's a perch there), since it's critical to avoid poop in the bird's food and water. As you can see below, Stewie likes foraging toys (you can count 6 different foraging toys in the picture below). Other types of toys he likes includes colored pine slats and shredders. Stewie doesn't much care for acrylic toys unless there are treats hidden inside, or foot toys. A variety of perches are provided for foot health, including a cement pedicure perch (in front of the food or near the door), several natural wood perches (bottlebrush wood is great for standing on as well as chewing up!) and long rope perches that stretch the length of the cage. Stewie sleeps on the highest perch in the cage, leaning up against a Cozy Corner (a fleece blanket that ties to the side of the cage). He used to have a Happy Hut sleep tent but his owner noticed that Stewie chewed on it, which posed a safety threat, and thus removed it. Since Stewie enjoys chewing on the rope perches, these do need to be replaced somewhat regularly as frayed perches can pose a hazard. When Stewie is out of his cage, he spends most of his time either on a shoulder or on a separate playstand with lots of natural branches. Henry the GCC is a rescue bird who loves his Caitec/Featherland stainless steel cage. This stainless steel cage is 18” x 27”. Henry's owner reports that this green cheeked conure is not particularly active in his cage and he is out a lot, so the cage size is working well, even though the minimum recommended cage size for conures is larger than this Featherland cage. Henry's owner says that finding toys that Henry likes has always been a challenge, but he likes the Birdy Bed (a fleece covered sleeping hut with a hard shell). This GCC also has a green fuzzy Cozy Corner for snuggling against. He doesn’t usually swing on the round swinging toy, but he does like to nuzzle against it. Henry also likes a leather toy with a bell, which is placed close to the Cozy Corner for easy reach. Henry spends most of his time on a sisal perch that stretches across the length of the cage. This is the "main perch", but other perches get rotated out regularly. Those include mostly wood branches of different sizes, one concrete perch and a rope boing. As you can see, even similarly sized conures can have very different tastes in toys and cages. We've highlighted a double flight cage, a regular flight cage, two dometop cages and a stainless steel bird cage, all with very different layouts and toy selections. Hopefully these four different examples of cage setups for conures give you some ideas for your own conure's cage. Remember, variety is the spice of life, and one way to keep your conure's cage interesting is to switch things up regularly. Looking for More Cage Setup Photos? Image credits: All photos used with permission. Big thanks to the contributors: Images of Sonny and Louie's cages, courtesy of Michelle. Photos of Stewie's flight cage, courtesy of Best in Flock. 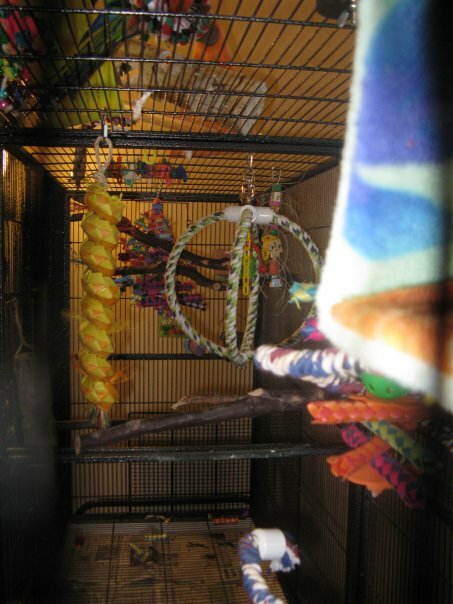 Photos of Valo and Nino's dometop cages, courtesy of Valobird.net. Henry's stainless steel cage courtesy of Fred K.
I loved your page. It gave me a lot of great ideas!!! Your cages looks awesome!! I have to admit, I am a complete parrot ‘snob’. I thought MY birds were the most spoiled and well-cared for, but WOW, Sonny and Louie’s set up is FANTASTIC!! All of the cages shown are GREAT, but as soon as we move, I’m going to copy that layout. I love the half-window, the privacy screen and the lighting. I have to give extra credit to Henry’s owner as well. 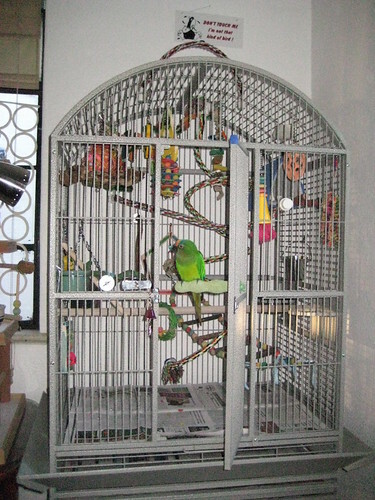 His cage looks much larger than the dimensions – it looks like he has plenty of room – it’s very apparent that Fred took his time in arranging the perches and toys to maximize the space. 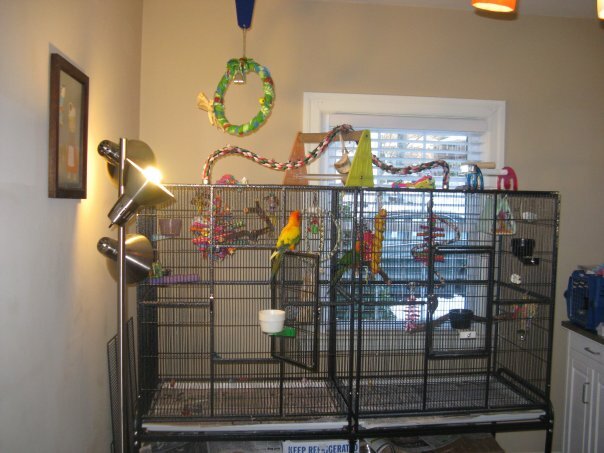 Great job to all of the owner’s whose cages are pictured, (especially Michelle – I want that double flight cage!!) AND to the site/author of this page. You’ve really captured the ideal way in which conures (or any birds for that matter) should be kept. These are excellent examples. The cages aren’t crammed with toys (I think that’s a biggie) but each cage has a nice variety. BTW, the site I linked to isn’t mine, it’s where I adopted my Grey. The owner is one of the nicest people I’ve ever met and she truly loves her birds. Thank you for the ideas. I am shopping for a new cage for my special one-legged sun conure and one thing I like about the cage I have now is I am able to remove the bottom grate so she can walk/hop easier on the bottom without risk of her foot getting caught. Is anyone aware of a good sized cage for conures where you can remove the grate and not have a sizable gap they can get caught in or escape from? Marina – rather than removing the grate, how about putting something on top of it? The flight cages we’ve seen leave a bit of an awkward gab if you remove the grate, but you could slide something over the grate to make it solid (e.g., newspaper or even a hard plastic sheet/liner cut to fit those dimensions. Great set ups. Can I use real sticks and regular rope? Is there a type of wood that may cause my Sun Conure to get sick? Is nylon rope ok or does it need to be hemp or cotton. Fantastic post, As an avid Conure keeper I’ve got to say that i’m really impressed with the attention to detail in this article, it also made my heart swell with pride while reading this to turn and look at Merlins (Sun Conure) cage and see a near identical setup, it’s always reassuring to know you are doing it right =) thanks for the post. Thanks so much , I will be getting a 2 year old sun conure soon . Excited and nervous . I am disabled and he was born with a defective leg , we will match perfectly. Have to get cage and all other must haves. Love all of the posts ,thank you for sharing . Hi! I just got my Sun Concures about a month ago. And I love them to death. I got Silly one and the next went a got his partner. I always wanted a parrot and now I am the proud owner of two. As I read up on them it is kinda intimidating because my cage setup is nothing like the ones I’m reading about. Silly is the so funny and our relationship continues to flerish. Buddy on the other hand is a bashful, he is slowly coming to me. I just hope I can continue to work with them. Pray for me & my feathered friends. Why Shop at Discount Parrot Supplies? DiscountParrotSupplies.com organizes great deals on new and used bird cages and other parrot supplies to help you stretch your pet budget further. A portion of the profit we make referring sales of quality parrot products will be donated to Phoenix Landing -- a non-profit parrot adoption, rescue and education organization. You should buy the biggest cage you can afford. 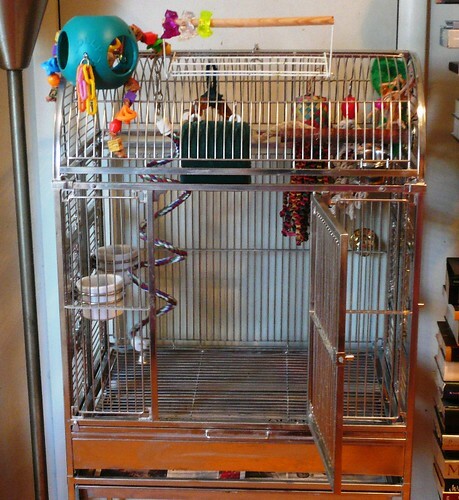 Getting a great deal on a bird cage means a bigger and better home for your parrot -- which means more room to play, more room for toys, and a better quality of life for your feathered kid (or "fid"). Need help finding the right size bird cage?